I have often thought that staying physically fit is not only a good way to live but also makes enormous economic sense as well. Not that staying fit will keep one’s healthcare premiums totally in check, but the simple fact is the cost of healthcare insurance in our country is downright scary. Staying fit is one way of keeping premiums not quite as egregious. Overall, annual premiums for families reached an average of $13,770 this year, up 114% since 2000. Employers passed health-insurance costs onto employees at a sharply higher rate this year, and businesses’ premiums grew more slowly than they have in a decade, according to an annual survey of companies. The increased cost-shifting reflected an acceleration of a trend that has been on the rise for years. As companies struggle to cut costs amid difficult economic times, more of them are reducing benefits they offer workers or making workers pay more for them. 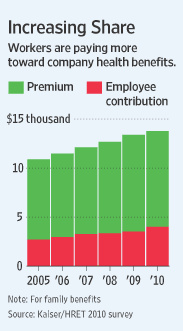 Still, companies are paying nearly three-quarters of workers’ health-care premiums. Employees paid an average of about $4,000 toward their family coverage this year, up 14% from last year, according to a report by the Kaiser Family Foundation and the Health Research and Educational Trust. But total insurance premiums paid by the employer and the employee rose just 3% for a family plan—the slowest rate of growth in 10 years, according to the data. The nonprofit research groups surveyed about 2,000 large and small companies between January and May. “It’s the first time I can remember when employers have coped with costs by shifting it all to workers,” said Drew Altman, the Kaiser Family Foundation’s president and chief executive. The survey showed workers with family plans are now paying 30% of their premiums, compared with 27% last year and 26% five years ago. Businesses explained the shift by pointing to stark choices between cutting staff and reducing benefits. As the increased costs are shifted to employees, what is the knock on economic impact? There is no doubt that discretionary consumer spending will suffer a further drag. That reality is nothing more than Principles of Economics 101.